Kitsilano (map, 3005 West Broadway, Vancouver, BC, Canada, phone: 604-734-3005), Broadway (map, 820 West Broadway, Vancouver, BC, Canada, phone: 604-731-6333), and Denman (map, 1096 Denman Street, Vancouver, BC, Canada, phone: 604-683-3333). 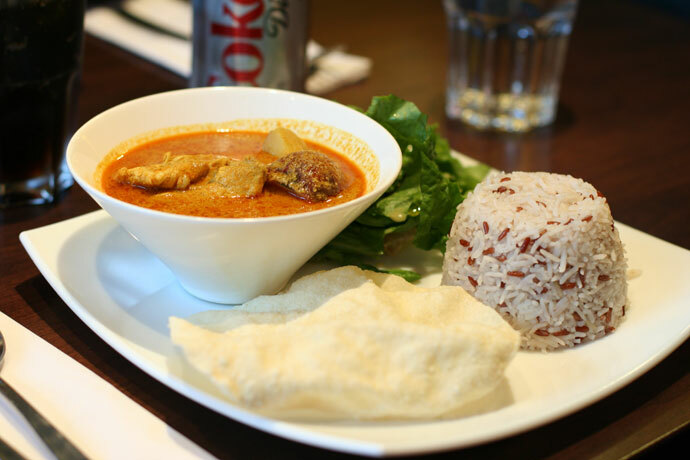 Malaysian fare isn’t about a singular distinctive taste, but about diversity, with a blend of culinary inspiration from India, China, Indonesia, Thailand, Eurasia, and Malaysia’s indigenous population. 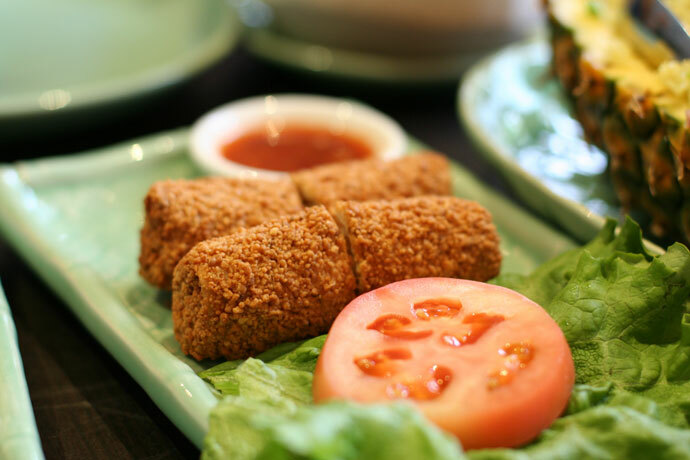 It combines the best of South East Asia, from India’s roti canai, Singapore’s laksa, to China’s Hainanese chicken rice, creating a menu that is a delight to try. Banana Leaf is good for almost any occasion. It’s probably our most reliable favorite, a great place to take out of town guests and go for a regular night out with your family as well. At roughly 12 – 20 dollars an entree, it’s a fantastic value as well, especially in the Kits zone of overpriced fare. Our favorites? 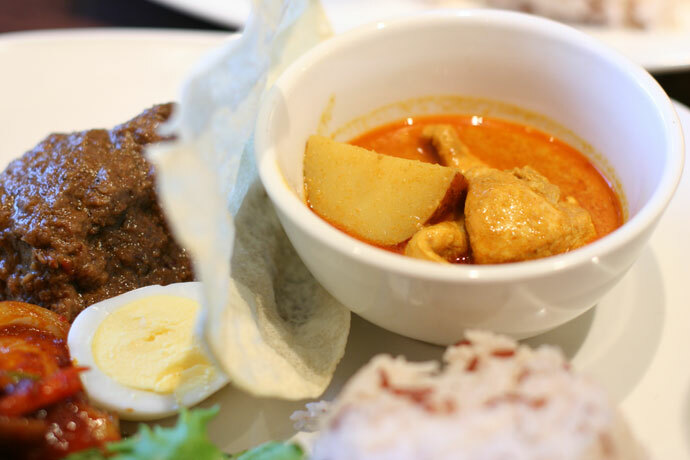 roti canai, the rendang beef, the lamb dish, sambal green beans, Tofu in Assam sauce, and sayur Lemak. Pictured below are some dishes I enjoyed when I visited their Kitsilano location earlier this year. 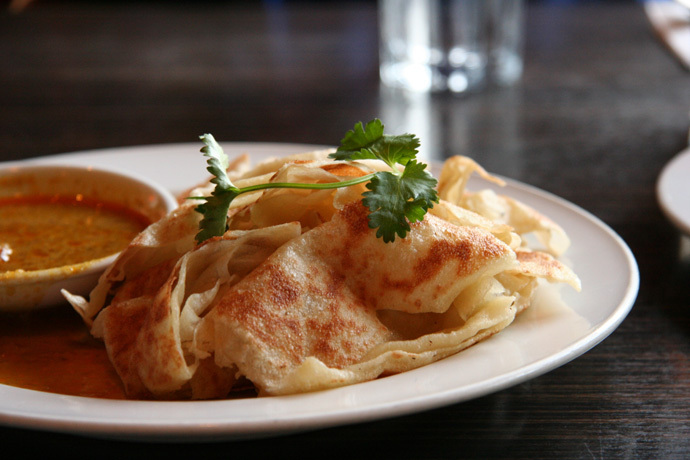 A great appetizer or side dish is the Roti Canai, an Indian-influenced puffy bread served with a wonderful rich curry sauce. 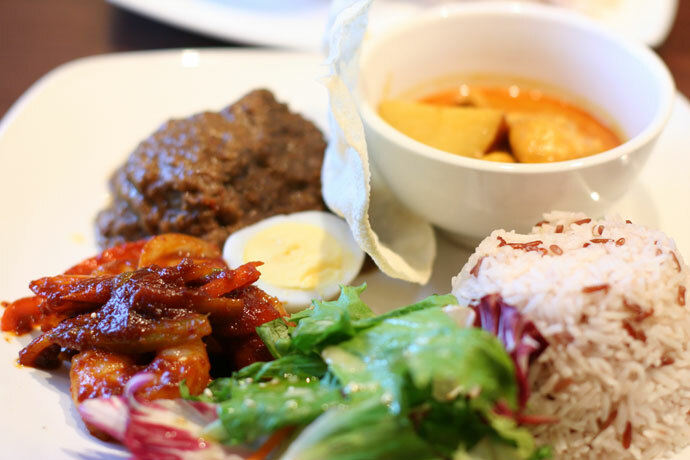 Also shown is a Malaysian vegetable curry dish (Sayur Lemak) as well as the Nasi Goreng: fried rice with beef, shrimp, egg, tomato, onion and green beans. I’m looking forward to visiting Banana Leaf again sometime soon. Roti Canai bread from Banana Leaf Malaysian restaurant in Kitsilano Vancouver BC Canada. 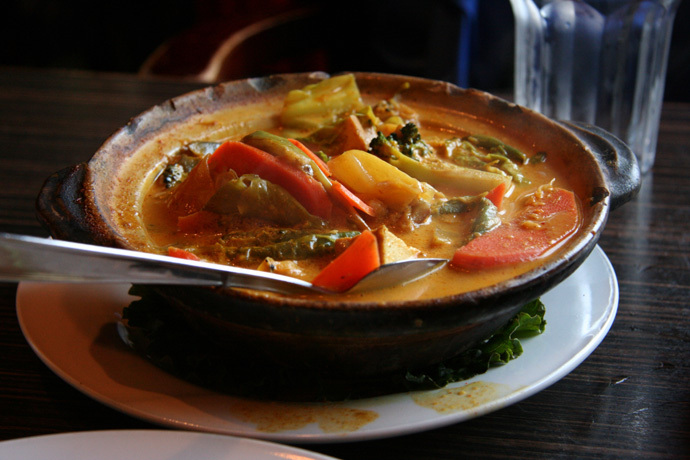 Sayur Lemak Malaysian Vegetable Curry from Banana Leaf restaurant in Kits Vancouver BC Canada. Nasi Goreng from Banana Leaf Malaysian restaurant in Vancouver BC Canada - Malaysian fried rice with beef, shrimp, egg, tomato, onion and green beans. Restaurant interior at Banana Leaf Malaysian Restaurant in Vancouver BC Canada. 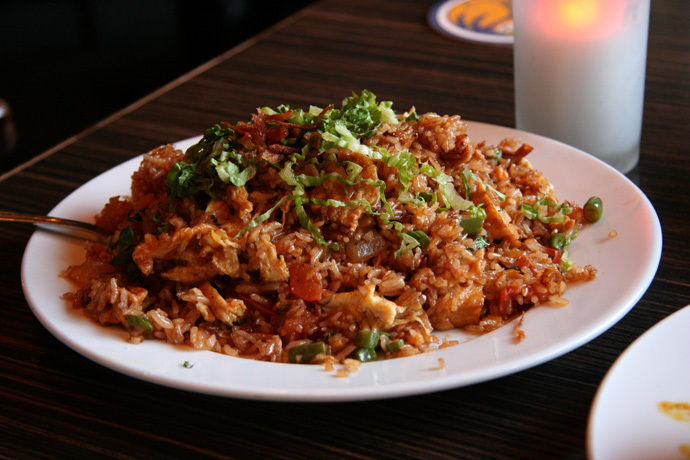 Tropika on Robson (web site, map, 1128 Robson Street, Vancouver, BC, Canada, phone 604-737-6002) is a popular Malaysian and Thai restaurant located on the second floor overlooking Vancouver’s trendy Robson Street shopping district (downtown), between Bute and Thurlow streets. The restaurant has won numerous awards for their innovative and unique decor, and more importantly for their food. 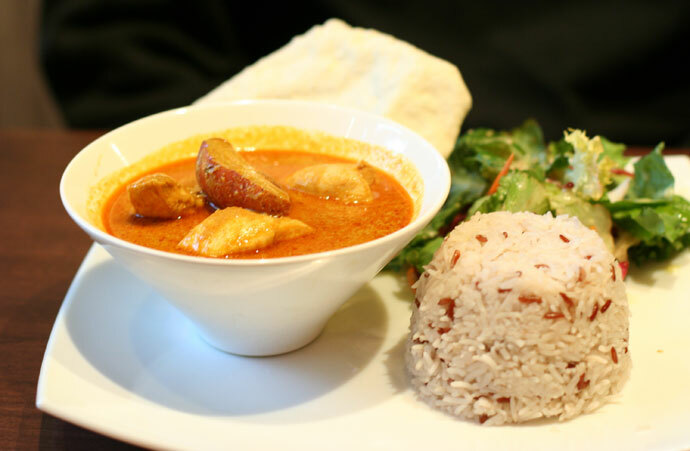 Their menu, which is full of wonderful mouth-watering photos, makes choosing dishes a snap – even if you’re not so familiar with Malaysian or Thai cuisine. 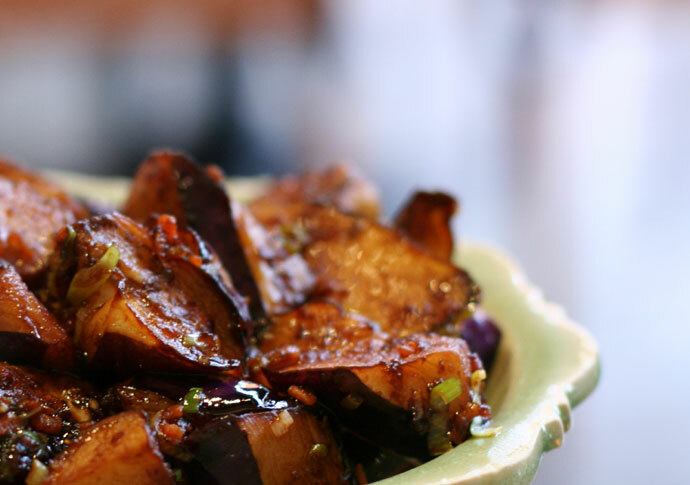 Simply look at the photos in the menu and let your eyes decide what to eat! On a previous visit (over two years ago) I enjoyed the satay skewers and the Hainanese chicken. This time we tried the following dishes (all pictured below): Indonesian spring rolls filled with chicken ($2.50 each), some delightfully puffy roti canai bread served with a special sauce ($2.95), the marvellous sambal clams ($13.95), an hot and sour eggplant hot pot with minced pork ($11.95), and the pineapple fried rice with ham and chicken ($12.95). An interesting drink that we tried was the Coconut Juice served in a real coconut (also pictured below). 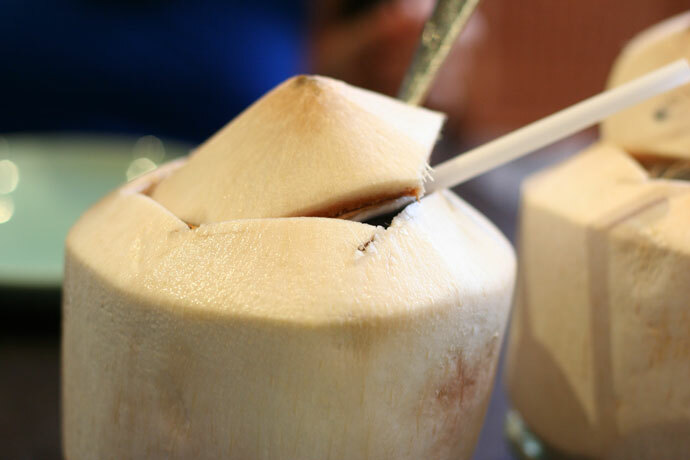 This was a huge coconut filled with some refreshing and slightly sweet coconut juice, that we could enjoy with a straw. 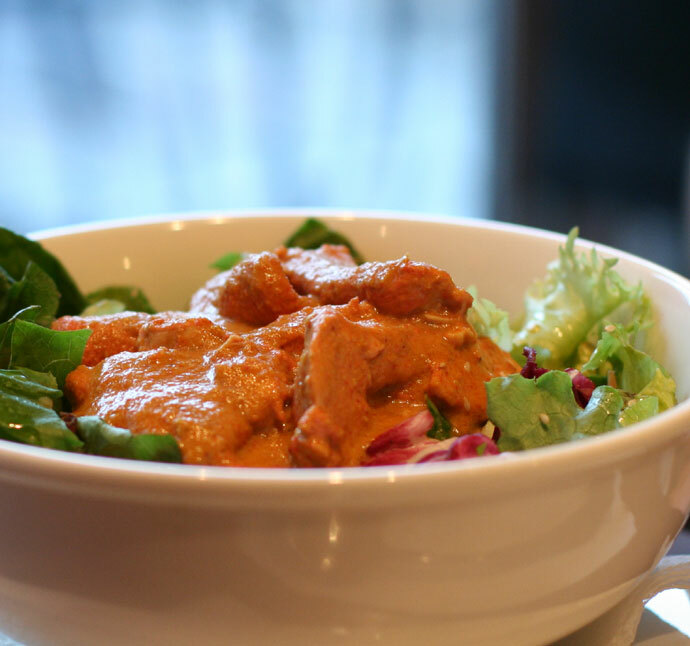 In addition to Tropika’s Robson Street location, the restaurant also has a couple of other locations: Tropika Cambie Street (map, 2975 Cambie Street, Vancouver, BC, Canada, phone: 604-879-6002), and Tropika at Aberdeen (map, unit 1830, Aberdeen Centre, 4151 Hazelbridge Way, Richmond, BC, Canada, phone: 604-233-7002). More info is on their web site. 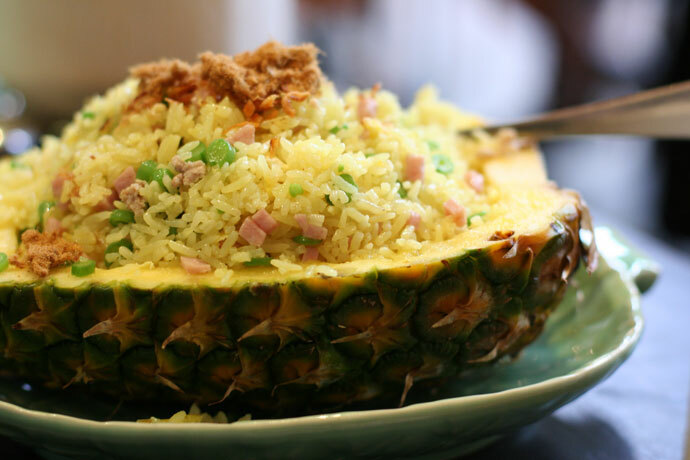 Pineapple Fried Rice with Ham and Chicken ($12.95) from Tropika Restaurant on Robson Street. Coconut Juice served in a fresh real coconut (around $4.00) from Tropika Malaysian and Thai restaurant in Vancouver BC Canada. 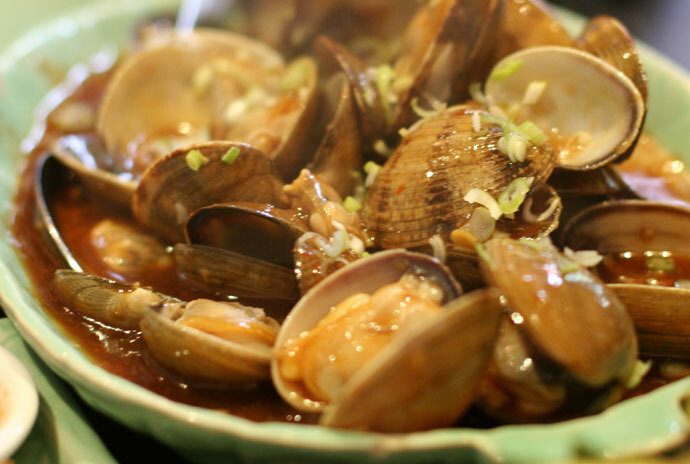 Jonker St Restaurant (web site, map, 1128 Pacific Blvd, Vancouver, BC, Canada, phone 604-688-8565) is a Malaysian cuisine restaurant in Yaletown (downtown Vancouver) that has been getting rave reviews. Being a ‘peranakan’ and foodie, we were pleasantly surprised that the quality of food at this outlet surpassed that one could find in Singapore or Malaysia particularly, the prawn noodles, roti canai and the chilli crab.Therefore, I would strongly recommend anyone who wishes to relish authetic Malaysian food. 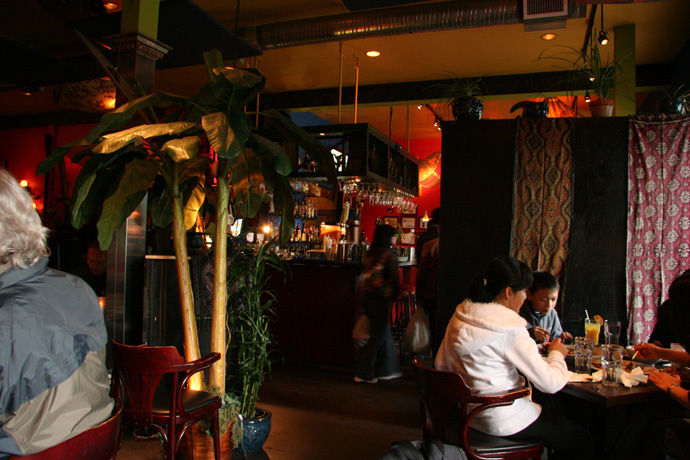 Restaurant is small and affords the staff and owner were very friendly and helpful. A must try! A merriment of three unique flavours! 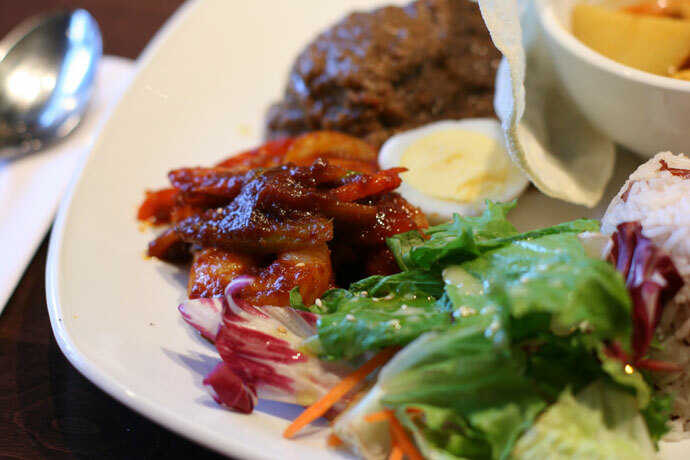 Sampler of chicken curry, beef rendang, prawn sambal on a platter with egg, side salad, pappadum cracker & jambori rice. Prices are reasonable, with most dishes in the $9 to $12 range. For a friend on a Gluten Free diet, the restaurant unfortunately only had one choice on the menu that she could eat. I was really satisfied with my Nasi Jambori. 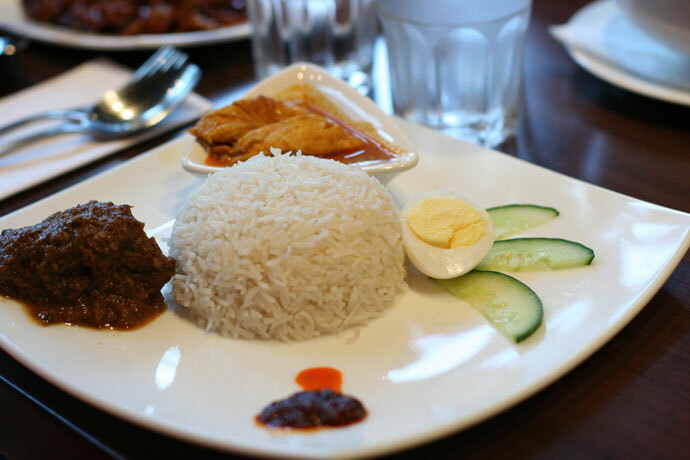 My coworkers and I agree that the flavors of the dishes were excellent and that we’d like to visit Jonker St. Restaurant again! Curry from Jonker Street Malaysian Restaurant in Vancouver. View More Restaurants in the Malaysian category. 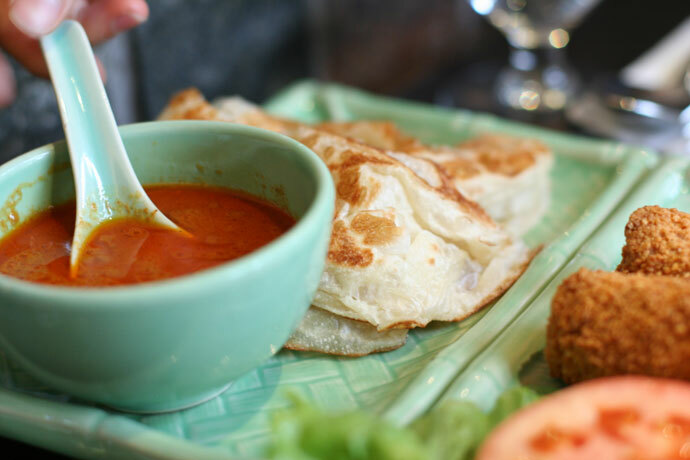 We hope you enjoy the great Malaysian restaurants on Dine Out Here Vancouver.